Steel wire rods are an all-round talent since they are the key product of steel industry with multiple uses. They are used as the material for fasteners, springs, bearings, wire ropes, chains, cables, wire meshes, wire fencings, tyre cord, reinforcement in railway sleepers, and many other uses. They are used for the components needed for the automotive industry, chemical industry, power stations and machine engineering. Unlike cold-rolled sheets, heavy plates, pipes, sections and other steel products, wire rods are seldom used as hot rolled for final products, but they are manufactured into machine parts after undergoing one or more stages of so called post-processing such as heat treatment, forging and wire drawing at specialist plants. Wire rods are generally drawn down to a specific diameter before being subjected to forging or other forming operations in secondary processing. In many cases, the size of the wire rods before being subjected to these forming operations is to be less than the minimum size of 5.5 mm that can be supplied as rolled. Generally each of the wire rod product is developed with due attention to its behaviour at the post-processing stages. What is required for a steel plant regarding wire rods is good processibility and fulfilment of the required properties after the processing. Furthermore, since the costs of the post-processing is sometimes several times the price of the wire rods, it is increasingly important to reduce the total integrated manufacturing cost from the steel material to the final product. Also thermo mechanically treated (TMT) reinforcement bars of 6 mm, 8mm and 10 mm basically required for the building construction are produced in the wire rod mills. The following generally characterizes the wire rod products. Product grades are widely varied from standardized ordinary grades for general applications to high quality grades for high-end applications with the specifications individually defined for each customer, mainly for the automobile and other manufacturing industries. The high-end products for safety-related applications typically such as automobile engines, drive train systems and chassis are used as functional materials and as such, are required to have highly demanding properties such as high strength and long fatigue life. Wire rod steel products are semi-finished products, which are seldom used as hot rolled, and they are manufactured into final products after secondary and even ternary processing such as forging, heat treatment and machining. The final industrial products for which they are used are subject to tough competition in the international market. The industrial products for which they are used are required to minimize the load on global environment throughout the life cycle. In developing a new wire rod steel product in consideration of the above, attention need to be paid to the important issues such as the following. These requirements are not always mutually compatible, and it is important to proceed with development steps based on good understanding of the operating conditions at the processing stages, the usage condition and characteristics of the final product for which the wire rods will be used and the like. Wire rods are used in a wide range of industrial fields. Therefore they have to meet given combinations of properties such as strength, ductility, cold formability, drawability, and hardenability. In addition, current market demands some additional properties in the wire rods which are (i) ultra- precision dimensional tolerances and ovality, (ii) lower scale loss, (iii) negative tolerances (in sectional weight), (iv) no variation in dimensions throughout the length of the wire rod, (v) uniform physical properties, and (vi) uniform weight with nominal variation between front, middle and back end. Wire rod quality has become increasingly important these days. For many application of wire rods, it is important that the wire rods have surfaces without any marks, scratches, shells, cracks, overfills, and oxide particles. Quality assurance throughout the whole length of the wire rod after rolling takes time and labour, and for this reason, quality control of billets, the materials before rolling, is of great importance. Billets are normally inspected by automatic magnaflux inspection equipment and conditioned for the removal of the surface defects. Because of the vast varieties of the requirements from the wire rods, wire rod mills are usually designed with versatility in mind. Reliable equipment, process consistency, production flexibility and waste minimization, all are needed from a wire rod mill. Further all size ranges, materials and alloys need to be rolled efficiently and with high productivity in the wire rod mills. The mill is to maximize productivity through process optimization and through minimized downtime and seamless interlinking of production stages. The complex mill layout of the mill needs to be optimized to ensure the time needed for the each process step, the required temperature profiles and efficient transfer areas. Further fast change-over is the key to the flexibility of the mill. The mill is to be able to convert to the next order while still processing the current one and change the line from one product to another with virtually no downtime. 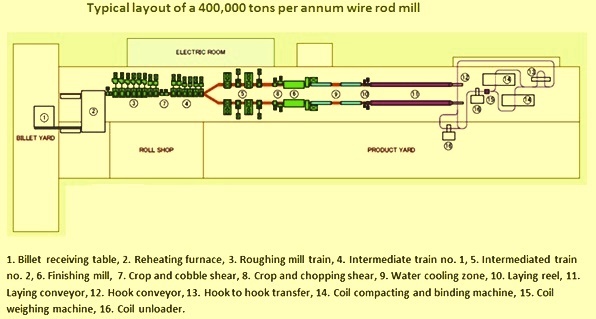 A typical layout of wire rod mill with a capacity of 400,000 tons per year is shown in Fig 1. Further, it is necessary that the wire rod mills are able to achieve very high precision with rolling stands designed to withstand high loads and changing temperature requirements. The combination of process technology, mechanical equipment, electrical components, and automation functions is a crucial aspect for the mill design. These together allow a wide range of process conditions for the desired qualities of the wire rod products. Also the mill has to be optimized for the cost. Cost optimization has many facets, including process controlled yield maximization, downtime reduction and maintenance cost controls. Further to comply with the needed requirements, the steel used for rolling wire rods may need sufficient alloying elements which can give austenite strengthening during hot rolling and deterioration of both cold-heading formability and drawing limit, due to the increase of as-rolled rod hardness. Therefore, expensive heat treatments (e.g. annealing) are carried out to soften the hot rolled wire rod. In order to reduce production costs, through a simplification of the whole process, on-line controlled cooling systems are applied, but further improvements are necessary to satisfy the customers. Wire rod producers have moved to more sophisticated rod products with in-line heat treatment as well as precision rolling technologies based on tension control plus AGC (automatic gauge control). Uniform heating of billets and tension control during hot rolling are generally used to achieve the required dimensional accuracy, since in practice it is difficult to guarantee closer tolerances by conventional wire rod mills over extended production periods. In the wire rod mills, it is normal to use rolls with grooves. Common groove sequences in the intermediate mills are ‘square oval’ and ‘false round (round) oval’. It is also widespread to use ‘diamond-square’, diamond-diamond, and ‘box groove’ sequences upstream in the roughing mill. There are other types of the pass designs also. The patented oval-round-round-round roll pass sequence of Morgan is designed for high-reduction rolling and for normalized and thermo-mechanical processing while enhancing surface quality and extending roll life. The roll pass design is to ensure a high yield and adequate quality of the wire rods which is of utmost importance for keeping the cost of production under control. For improving the productivity, wire rod mills normally are focussing on minimizing the downtime of the mill. The effectiveness of such focus is usually enhanced by reducing the time and need for changing rolls when new final dimensions and new steel grades and shapes are to be manufactured. This is achieved by improving the working range, also named flexibility of the series. Improved flexibility is reached when large amount of different steel grades, with different shapes and dimensions are rolled with a minimum change of the rolling schedule. Every steel grade is characterized by its specific way of material flow, such as different spread, when passing through the roll gap. Also the start-up time and time waiting for correct rolling temperature, depending on the actual steel grade, need to be decreased. However different heating cycles still cause too high downtimes when a wide range of grades is to be rolled. In order to meet the market demands of today, which include smaller lots and numerous kinds of steels, it has become a necessity that the modern rod mills show a high degree of flexibility. Advances in wire rod production technologies (e.g. interstand cooling, addition of sizing equipment after conventional finishing-block, improved controlled cooling facilities) allow the introduction of precision rolling as well as thermo-mechanical control process (TMCP), expanding of the range of low and medium carbon steel wire rods, and manufacture of wire rods suitable for simplified production routes or direct processing. By high precision rolling technologies, it is possible to achieve low finishing rolling temperatures, in addition to improved product dimensions (tolerances). Location of the compact sizing mill after the finishing block is advantageous not only for obtaining increased productivity, but also for improving metallurgical properties. The ability to roll products at low temperatures makes it possible to use the benefits of thermo-mechanical rolling in grain refinement in order to increase ductility and shorten subsequent thermal treatment processes. However, there are several parameters which need to be considered in the thermo-mechanical process. These are (i) location of rolling equipment, (ii) location of water cooling, (iii) rolling rates, and (iv) finish rolling temperatures. For example, the introduction of a mini-block helps in reducing the finish rolling temperatures below 950 deg C in an existing wire rod mill which is having limitations in separating force and power and hence having finish rolling temperatures of higher than 1000 deg C. However an adequate distance between the no-twist mill and the sizing mill is necessary for the use of water cooling in order to reduce the rolling stock temperature. The location of the sizing mill is important to allow time for the rod to be controlled cooled and equalized prior to the final reduction, thereby reducing the risk of over-heating of the rod core. This is crucial for special steels which are sensitive to grain coarsening at high finishing temperatures. Also a critical combination of strain and finishing temperature is needed to promote a uniform microstructure. Static and meta-dynamic recrystallization processes are strongly dependent on temperature and accumulated strain. During rod sizing, without a sufficient amount of strain, either the recrystallization process is not adequately promoted or low number of recrystallized sites are nucleated. Consequently, localized coarse grains can occur. The introduction of thermo-mechanical processing of wire rods leads to higher finishing speed and finer austenite grain size. The consequence is that a different cooling pattern is to be used along the conveyor due to a different transformation behaviour and wrap overlapping (coil build up at the loop layer). In this respect, mathematical models able to predict austenite evolution during hot rolling and controlled cooling of wire rods, can be effectively applied, together with present plant and technological data, to predict the effect of plant configuration, rolling and cooling practices on evolution and uniformity of wire rod microstructure. With the wire rod reducing and sizing mill located between the finishing block and laying head, water cooling and equalization zones provide controlled entry temperatures, which can be as low as 750 deg C, to achieve fine grain structure. The resulting improved properties can reduce or eliminate costly downstream annealing processes. Various steel grades can benefit from low temperature rolling as given below. In case of cold heading wore rods the benefits include requirement of less peeling thus reducing losses. Peeling, material losses can be reduced by up to 30 % for certain stainless steels and titanium grade products. Also improved formability and excellent tolerance can result in scrap savings of up to 50 % for downstream processes such as the making of the bolt. In case of the spring steel wire rods the benefits include the reduction in martensite formation, particularly in wire rods of small diameters. Also in such wire rods there is lesser requirement of frequent pre-drawing heat treatment. In case of the electrode quality wire rods, the benefits include refined microstructure which enables better drawability and finer grain size which suppresses martensite formation. In case of bearing steel quality wire rods the benefits include the formation of pseudo-spheroidized microstructure with fine, well dispersed carbides. Also it avoids most downstream spheroidize annealing thus totally eliminating or reducing soak temperatures and times. It also reduces hardenability which eliminates martensite formation. In case of wire drawing quality wire rods the processing at low temperatures through the reducing and sizing mill can provide several advantages to the downstream wire drawing plant. These are (i) better mechanical descaling, with uniform breakage of scale, reduction of martensite on rod surface and decreased wire breaks, (ii) improved tensile uniformity as a result of excellent size tolerance and ovality, (iii) increased die life, with better lubrication and even drafting, and (iv) optimized die configuration with non-standard rod sizes through free-size rolling. Many wire rod mills of today have on line gauge measuring systems and on line gap adjusting procedures. These systems make it possible to be on dimension on the first rolled wire rod and to have full control of the rolling with no need for rolling trial bars. In wire rod mills traditionally available methods to detect surface defects are crude which include etching and filing, upset testing, visual testing etc. But all these methods finally end up being impractical considering the quantity of material produced by a high speed modern wire rod mill and the harsh environment in which the quality control personnel have to work. The consumers of hot rolled wire products are always demanding better surface quality. Efforts to improve the quality of shipped product have necessarily moved away from mere inspection and toward process improvement. Hidden away within the melting, and rolling processes are potential sources of surface defects. Finding them requires ingenuity. Anyone familiar with process improvement understands the importance of a good response variable by which the effects of changes to the process can be reliably measured. It does little good and frequently much harm to adjust process variables when there is no clear way to measure the results of the change. Given the mill conditions described above, the response variable for surface quality has been elusive, but an inline eddy current surface inspection system has shown promise. It is the only method available these days to detect potential production problems before they lead to severe quality and material losses and at the same time. This method also carries out reliable flaw detection in the rolled product. It has proved to be a very useful device for finding many types of surface defects on hot-rolled wire rod coils. It is not yet clear whether it can detect tightly rolled seams. Even more impressive, however, has been its ability to indicate the effects of deliberate or unplanned changes in the processes that produced the coil.